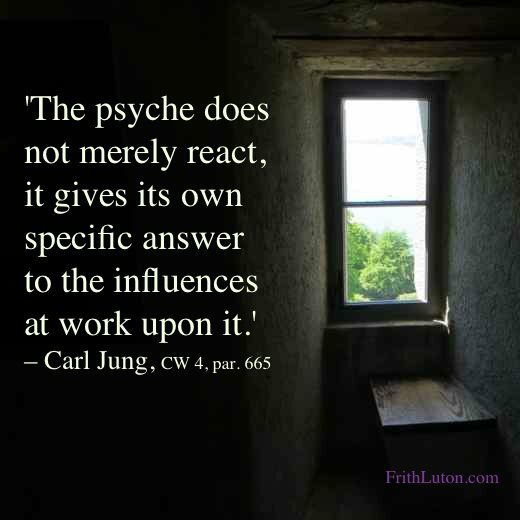 The process of self-regulation is going on all the time within the psyche. It only becomes noticeable when ego-consciousness has particular difficulty in adapting to external or internal reality. That is often the start of a process, proceeding along the lines outlined in the chart (below), that may lead to individuation. 1. Difficulty of adaptation. Little progression of libido. 2. Regression of energy (depression, lack of disposable energy). 3. Activation of unconscious contents (fantasies, complexes, archetypal images, inferior function, opposite attitude, shadow, anima/animus, etc.). Compensation. 4. Symptoms of neurosis (confusion, fear, anxiety, guilt, moods, extreme affect, etc.). 5. Unconscious or half-conscious conflict between ego and contents activated in the unconscious. Inner tension. Defensive reactions. 6. Activation of the transcendent function, involving the self and archetypal patterns of wholeness. 7. Formation of symbols (numinosity, synchronicity). 8. Transfer of energy between unconscious contents and consciousness. Enlargement of the ego, progression of energy. 9. Assimilation of unconscious contents. Individuation. (2) Consciousness, because of its directed functions, exercises an inhibition (which Freud calls censorship) on all incompatible material, with the result that it sinks into the unconscious. (3) Consciousness constitutes the momentary process of adaptation, whereas the unconscious contains not only all the forgotten material of the individual’s own past, but all the inherited behaviour traces constituting the structure of the mind [i.e., archetypes].